We are asking organizations to endorse our call for all charges related to these protests to be dropped. We’ve written a guide for how union members can bring it to a local meeting to endorse it. We also have a petition for individuals to sign. On January 20, 2017, thousands took to the streets of Washington, D.C., to protest the presidential inauguration of Donald Trump. During one of the many marches held on Inauguration Day, the D.C. Metropolitan Police Department showed the world how it planned to treat dissent moving forward: Shortly after the protest began, hundreds of protesters were attacked with pepper spray, rubber bullets, and batons. Police confined over 200 people within a “kettle” for hours before arresting them. Every protester’s cell phone was confiscated as evidence and rooted through. Upon being released, they were handed a riot charge. Months later, US attorneys piled on 8 additional felony charges, including “Conspiracy to Riot”. Protesters now face up to 75 years in prison – all for attending a demonstration. Among the people arrested were over two dozen members of our union, the Industrial Workers of the World, and its affiliated legal defense and community organizing body, the IWW General Defense Committee (GDC). Within the IWW and GDC, we don’t shy away from our members’ politics, and support our members’ rights to express their politics through protests and marches, a tradition that goes back within our union to battles over free speech in the early 20th century. Since the arrests, D.C. prosecutors and police have shown a disturbing pattern of repression as well as specific targeting of IWW and GDC members. Our members had their union cards and buttons confiscated and held as evidence. Months after the protest, three individuals (including two prominent members of the DC IWW local branch) were served with warrants for their arrest on charges of conspiracy to riot. Prior to their warrants being issued, the prosecutor’s office revealed that they had created separate trial groupings, including one grouping where nearly all defendants were IWW or GDC members. While they will not say as much in public, it has become clear that the city attorneys for Washington, D.C. are treating membership in our union as evidence of a criminal act. This is not the first time the IWW has been targeted for repression, and it is unlikely to be the last. The crackdown on protesters in D.C. is part of a larger effort to criminalize and silence dissent in working-class and marginalized communities. D.C. is just one of more than a dozen states that are attempting to quell dissent through legislation or harsh legal penalties. This is not a coincidence. People in power want activists and organizations to be afraid to protest Trump’s agenda. This was originally sent to KOIN 6 as a response to the events that took place on May Day in Portland. 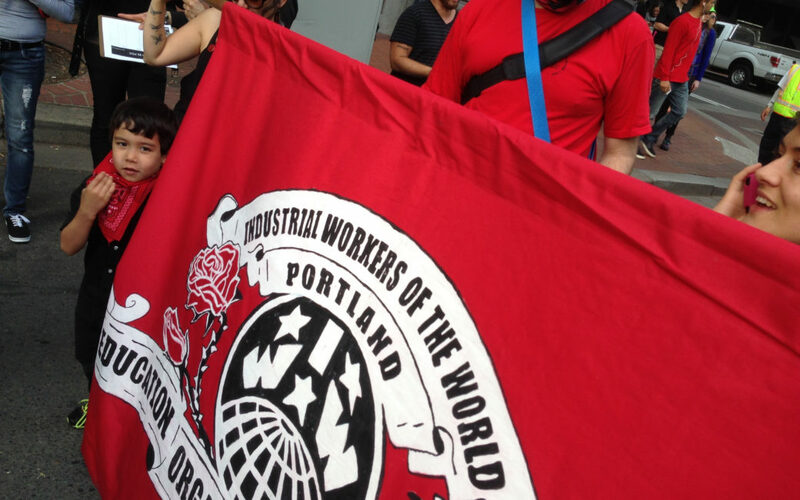 The Industrial Workers of the World is proud that we were able to celebrate International Workers Day and march in solidarity with so many organizations which are essential and vibrant to the community of Portland and at large. International Workers Day is an important holiday that showcases the struggle of all workers against the wholesale societal systemic oppression brought about by corporations, CEOs, and the mega-rich capitalist class. The fact that there was such a strong contingent of marchers from all walks of life is representative of the American working class. The Portland Police Bureau’s use of violence against workers and their families – as well as the children who were in the crowd celebrating the holiday with their parents – is a travesty and a violation of both human rights, as well as the right to peaceful assembly. We condemn their efforts in restricting accessibility to fellow workers with disabilities, and their blatant disregard for the health and well-being of the people they have sworn to protect. By direct contrast, they assisted visible white supremacists and white nationalists at the “March for Free Speech 82nd Ave,” specifically a non-permitted march by pro-Trump supporters on April 29th by chartering Tri-Met buses and public transportation to get these people, some of whom were making Nazi salutes during their protest, back to their vehicles. Our goal is and has always been to support and assist the workers of the world, and we will continue to fight for the needs of all in the face of police and capitalist oppression, and stand by our watchword that an injury to one is an injury to all. 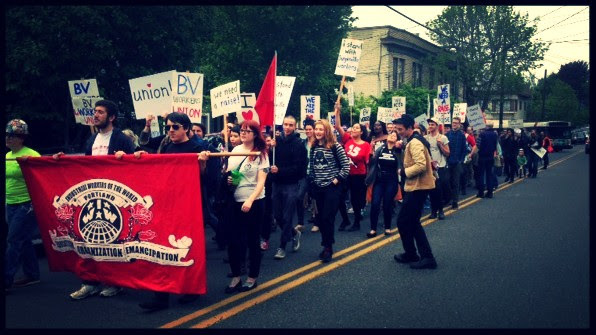 As such, the Portland Police Bureau inflicted shameful injury against the workers, their families, and their children during the May Day march; we will stand against that in solidarity with our fellow workers. Labor-focused episodes of Roseanne and The Simpsons at our Worker Wednesday! Watch as an overworked and disrespected Roseanne fights back against her boss at the Wellman Plastics factory with her characteristic sharp wit! IWW Worker Wednesdays are a great opportunity to meet some Wobblies and other workers, talk about campaigns & union stuff, and get to know each other. Popcorn will be provided, BYOB or other snacks! What were your first 7 jobs? 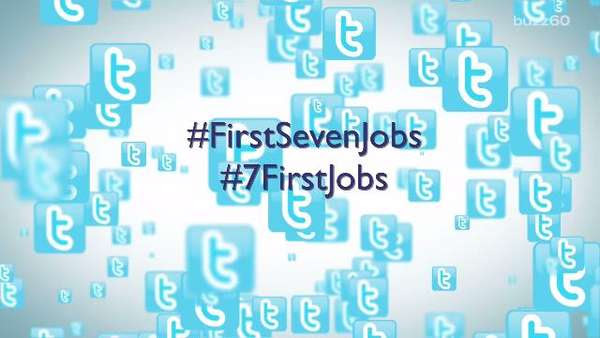 You might have seen #firstsevenjobs buzzing around on social media last month. The Portland IWW invites you to an event to eat some food, share our “first seven job” stories, and hear yours! We’ll have a few Wobblies get us started by sharing their stories, and then open up the mic. 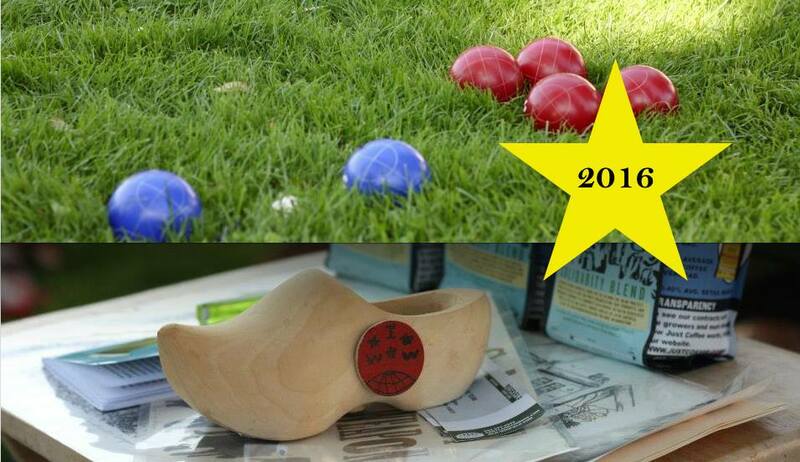 At the end, we’ll award some prizes for the winner of our special BINGO. No need to feel embarassed, everyone’s got a great story to tell! This will be a potluck so in addition to bringing your stories, bring a labeled dish/beverage to share! If you’ve never been to our hall or any Portland IWW event, this will be a good first event to make it out to! The Portland IWW Hall is located at 2249 E Burnside St.